Annisquam Herb Farm: from Herbal Roots zine! I’m excited to offer 6 giveaways today, 1 JyARz per winner! These cool little containers get more amazing every day to me. 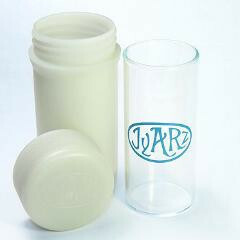 Made from glass, recycled milk jugs and latex, JyARz are eco friendly, protect the contents from exposure to light and are travel and shatter proof! 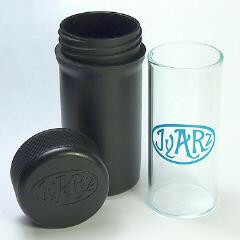 JyARz are portable, airtight, glass-lined, eco-friendly travel containers that are made in the USA. They are 1.25 fl. oz. The uses for these cool little jars are limitless. Store dried herbs in your first aid kit, tinctures in your back pack, even fill with a salve or oil for easy transport! 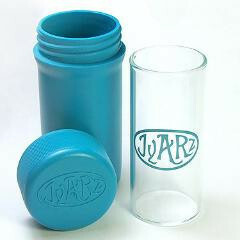 The glass liner removes from the plastic sleeve for easy clean-up. I love these little containers and will be incorporating them into my first aid kit, to protect my herbal remedies and keep them fresh. Go to Herbal Roots for the rest of the story!